It seems to me that it used to be easy to select multiple tages... I can't figure out how to do it any more. Is this a problem with Zotero 4? Zotero still lets you select mutiple tags, but you cannot select an additional tag if adding that tag to the filter would mean that no items are returned. Ahhh... right. Thanks. And how would I select multiple tags so that I could export all the references with tags that I wanted to include? would return all items that have at least one of those tags. 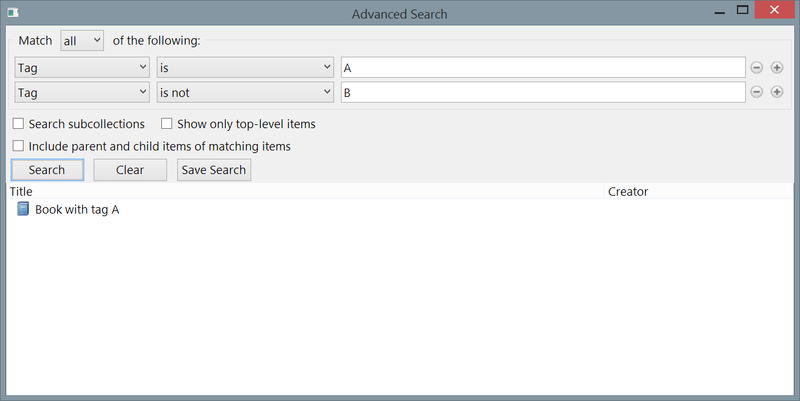 You can then create a saved search and export those items. Thanks very much - I'll do that. I was just looking for a solution to the quite similar problem. Thanks for already having an answer! 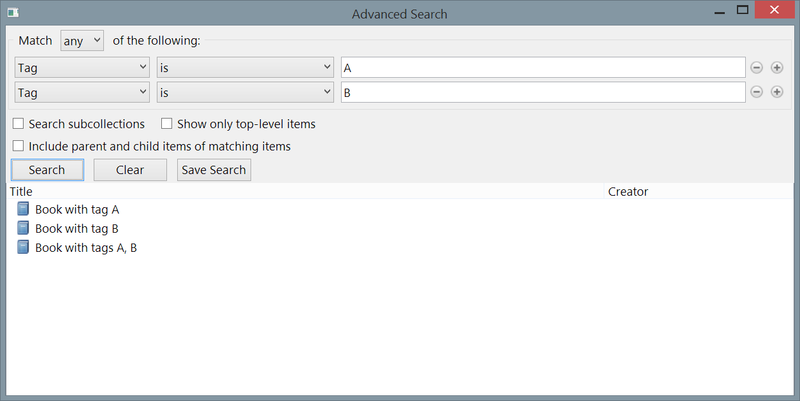 However, I think it would be comfortable for a lot of users, if this type of search could be integrated in the “tag”-selection itself. Let’s say via a way to distinguish, if the click on a tag returns ‘just those’ items containing this tag OR if it only ‘highlights’ them until a second (or more) tag is chosen to exclude the unchosen. With this the “any” command talked about before or search strings as “AND” or “OR” would be integrated in the tag-selection. Most likely this could be done either by defining a keyboard short-cut or – more likely – a third state of clicking on a tag in the tags-area (not chosen; “AND chosen” [as is now]; and “OR chosen”). I hope this can be done with zotero and I hope that this would not annoy other users used to the two states as is at the moment. Probably such feature should be selectable in the settings of zotero. As I am not into programming I wouldn’t know if or how zotero could be modified to fit to my suggestion. you are right. For a lot of users it would be very comfortable to have a better tag-selection pane with AND and OR functionality. This topic is discussed since a long time (see here ) and unfortenately until now it is not realised. I do agree with all of you, it would be very useful to have a easier way to select items that contains tags A or B. In fact the method proposed by adamsmith (second comment) works well, but it requieres many clicks and keyboard entries.